Rarely do I say a movie is better than the book, however I must admit that I did enjoy The Maze Runner film more than I did its source material. The director Wes Ball (with the help of script writer Noah Oppenheim) takes a few creative liberties, while remaining rather faithful to the book, which streamlines the plot and helps to flesh out some characters in a way that was unfortunately absent in the novel. The premise is intriguing enough to hook in non-readers of the series, everyone knows dystopian post-apocalyptic themes are all the rage right now. We open with our protagonist (played by Dylan O’Brien) in the dodge looking elevator (the box), moving slowly- before gaining momentum- upward. He’s disorientated and freaking out, understandably, as the lift moves faster. When the box grinds to a halt and the doors open, he finds himself with a colony of boys who welcome him to the Glade – a large open field surrounded by enormous concrete walls. He has no knowledge of where he is, doesn’t know where he came from, and he can’t remember his parents, his past, or even his own name. I like that his name literally gets knocked back into him- it takes getting punched out for him to remember that his name is Thomas. Thomas is just getting used to working without asking too many questions with the seemingly-wise Newt (Thomas Brodie-Sangster), tolerating the douchetastically brutish Gally (Will Poulter), and becoming fond of the adorkable Chuck (Blake Cooper) when he’s attacked by someone stung by a griever (biomechanical creatures in the maze) and his questions come right back. Back with such force that in a moment of sheer adrenalin he breaks protocol and runs into the maze after my fav- I mean- Minho (Ki Hong Lee) and Alby (Aml Ameen) as the huge walls close. The arrival of Teresa (Kaya Scodelario), a girl with links to Thomas’s past, delivered via the box bearing a note saying she’s the last one ever, alerts you to the fact that the proverbial ‘it’ is indeed about to go down. Soon enough the boys aren’t just fighting against the grievers and institutionalisation but amongst themselves with regard to rules, power and the pecking order. William Golding would be stroking his beard with keen interest. The film doesn’t shy away from doing its darned best to elicit feelings of concern for the characters, even if you’ve read the book there are enough differences to warrant you wondering if they’re going to go full rogue with the storyline. I’m liking the direction they’ve taken with the plot and our characters, especially Thomas and Teresa. Thomas doesn’t annoy me as much as he did in the book. If at all. Teresa is given much more agency, seriously the changes to the plot to allow Kaya more screen time and Teresa a bit more growth worked wonders for the character. They’ve done away with the telepathic link between the two, which I liked. It forces the script to be tighter and not waft about with two characters talking to each other in their heads as everyone else looks on as the awkward silence lengthens. Visually the movie’s rather pretty, and I’m not just talking about the cast. The film is prettily shot, making the glade appear rather lovely and the maze is as ominous and colossal as you would imagine it to be with the grievers being the perfect mix of terrifying and disgusting. The cast had excellent chemistry, believable comradeship and the budding bromances, with enough moments of tension-relieving humour to allow you space to breathe. However the movie does suffer slightly from pacing problems, starting off a bit slow before suddenly kicking it up about 400 notches so that everything in the second half of the film feels like it’s happening all at once. They hit you with a whole lot of exposition at the end, but I suppose it’s either that or you and the gladers leave utterly confused about everything- not that there’s too much clarity for our protagonists when they leave. The whirlwind explanation of WCKD leaves you slightly breathless before the final twists that punch you right in the feels. WCKD is good…? 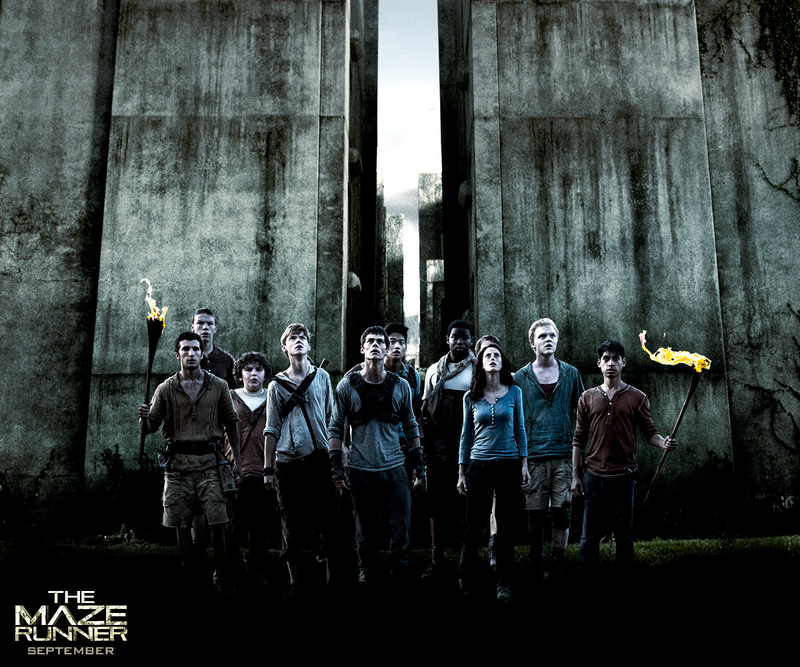 The Maze Runner opens in NZ theaters on Sept 25th. This was great! Dylan O’Brien should just be in everything! I tried getting past the first few chapters of this book since what feels like forever but just couldn’t do it. So the film’s given me an incentive to re-read the final 10 or so chapters and then start on the 2nd book. I agree with the doing away with the telepathy b/w Thomas and Teresa, it was, for a lack of a better word..lame. But it could just me, whenever there is mind reading, hearing thoughts etc involved I am immediately doubtful of the material’s likability. Haha yeah nah the telepathy thing was a bit much and it’s not at all integral to the storyline. Yeah give it a go lol but I have very strong (angry lol) opinions regarding the books.